This Philips Ambilight TV will change your TV experience dramatically. 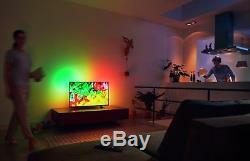 Ambilight extends the picture with LED lamps on your wall and makes the viewing much more immersive and at the same time more comfortable for your eyes. All this combined with a state of the art picture improvement system that takes your 4K Ultra HD content to new levels in sharpness, colors, motion and contrast. The new improved philips saphi smart tv system has an upgraded user interface, for you to find all the content very fast and easy, such as youtube, Netflix 4K UHD and freeview play. 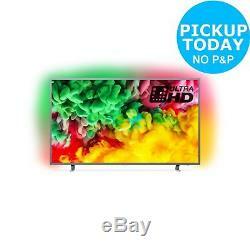 Television picture quality:LED TV Screen. 4K Ultra HD display resolution. Dimensions:Screen size: 43 inches. Size of TV H57.4, W97.2, D6.7cm. Size of TV with stand: H60.5, W97.2, D21.3cm. Philips 43PUS6703 43 Inch 4K Ultra HD HDR Amiblight Smart WiFi LED TV. Weight of TV 8.7kg (unpackaged). Weight of TV with stand: 11.1kg. Footprint of TV 68.8cm. Suitable for wall mounting 200 x 200 bracket. Length of cable: 1.5m. Packaged size H71.4, W107, D14cm. 2 x 10 watt RMS power output. 2 USB ports and 3 HDMI sockets. DLNA compatibility - allows you to wirelessly send content from devices like laptops, tablets and smartphones. 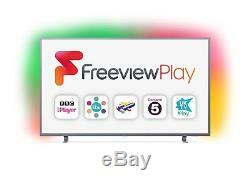 Compatible with the following smart apps: Netflix, BBC iPlayer, iTV, demand 5, Amazon Prime, youTube. Features USB recording and video playback. HDR - makes whites brighter, intensifies colour and enhances the overall picture for an epic cinematic effect. On mode power consumption 69 watts. Off mode power consumption 0.3 watt. Standby power consumption 0.3 watt. We can often deliver much faster in specific regions. New with 12 Month Guarantee. This product may have minor cosmetic marks or scratches. These will not hinder the functionality. This is a B Grade refurbished product and may have obvious marks or scratches. Argos B Grade is our second grade of refurbished product. These items are professionally refurbished, but might have more obvious marks or scratches. This does not affect the functionality and is purely cosmetic. They have all been comprehensively tested, presented in full working order and the item will have been professionally refurbished. Importantly, there may be obvious cosmetic marks. These could include moderate to heavy scratches, scuffs, marks or dents. None of these will affect the functionality of the product. Factory settings will be restored (if applicable) and will be in original retail or replacement packaging that may have marks, scuffs or stickers on the boxes. A small percentage of packaging may show some signs of transit with the occasional box having been opened. Delivered direct by our Supplier. We are unable to deliver this product. Free instant pick-up today from an Argos store. Internet TV & Media Streamers. TV Reception & Set-Top Boxes. DVD, Blu-ray & Home Cinema. TV & Home Audio Accessories. Home Audio & HiFi Separates. IPod & MP3 Player Accs. Drives, Storage & Blank Media. Printer Ink, Toner & Paper. Safety Gates & Stair Gates. TV & Film Character Toys. Soft Toys & Stuffed Animals. Travel Bags & Hand Luggage. Car Stereos & Head Units. Laser Hair Removal & IPL. Boy's Clothing & Accs. Girl's Clothing & Accs. Baby & Toddler Fancy Dress. Philips 50PUS6703 50 Inch 4K Ultra HD HDR Amiblight Smart WiFi LED TV. Sony KD43XF7073SU 43 Inch 4K Ultra HD HDR Freeview HD Smart WiFi LED TV - Silver. 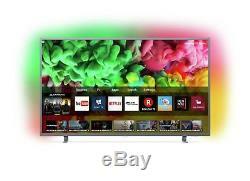 Philips 49PUS6803 49 Inch 4K Ultra HD HDR Freeview Play Amiblight Smart LED TV. Sony KD49XF7073SU 49 Inch 4K Ultra HD HDR Freeview HD Smart WiFi LED TV - Silver. 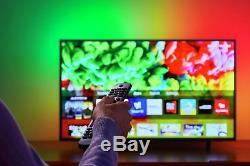 The item "Philips 43PUS6703 43 Inch 4K Ultra HD HDR Amiblight Smart WiFi LED TV" is in sale since Tuesday, June 26, 2018. 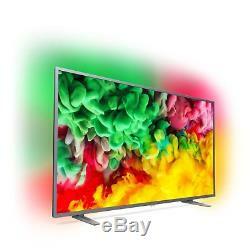 This item is in the category "Sound & Vision\TVs". 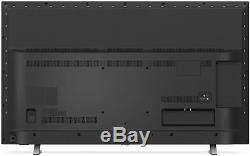 The seller is "argos" and is located in UK. This item can be shipped to United Kingdom.